For over 33 years now, Apologetics Press has endeavored to provide a broad spectrum of materials designed to defend the Christian Faith. We have sought to expose the multiplicity of “wiles” (Ephesians 6:11) that Satan generates to divert people from the truth. Our multi-faceted strategy has included the production of books, tracts, correspondence courses, magazines, Web articles, audio/video resources (e.g., DVDs), and even a children’s television program. We are constantly on the lookout for both scriptural and effective methods by which God’s Word may be communicated to the world. Consequently, we are venturing into a new area of media that we think will be useful in promoting the Cause. You’ve heard it said many times that “a picture is worth a thousand words.” That saying is accurate. Evolutionists certainly recognize this principle, and they have used it effectively to promote their error for many decades. Think of the destructive effects indelibly imprinted on youthful minds in public schools across America for over 50 years now at the sight of alleged ape-like ancestors of humans. I well remember seeing a wall poster in my 7th grade science class in Phoenix, Arizona in the 60s that showed the transformation of a chimp into a human by gradual change. Well do I remember the vivid, colorful pictures of Java Man, Nebraska Man, and Piltdown Man plastered in science magazines and school textbooks. These images served to “put flesh” on evolutionary theory and create the false impression that evolution is factual. Indeed, the damage done to millions of young minds has been catastrophic. And what have those who believe in the Bible done in response to this pervasive propaganda? Virtually nothing. In fact, have you ever seen a picture of Noah’s ark that included a pair of dinosaurs? 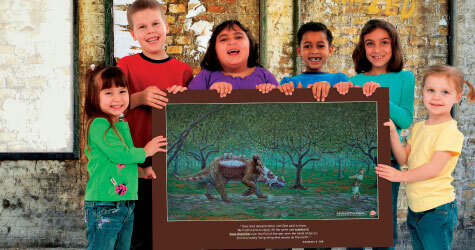 Have you ever seen a picture or poster of humans cohabiting with dinosaurs? Not likely (though we at A.P. have published a number of such pictures in our publications over the years)—certainly not in public schools! It’s past time for us to counter the forces of evil in this regard. As a result, we are delighted to release the first A.P. poster that depicts a hypothetical scenario involving a human interacting with a dinosaur. We have taken “Deers in the Forest,” one of the beautiful art pieces of Lewis Lavoie (who illustrated the A.P. kid’s book Dinosaurs Unleashed) and created a poster format with a relevant verse. A full 24 x 36 inches, this outstanding work of art is suitable for framing and deserves to be displayed on the walls of children’s bedrooms, church classrooms, and even public school rooms across the nation. Please take the time to order copies for those in your circle of influence.